No matter what your reasons are, this is the perfect opportunity to bring a 2019 China Gold Panda home to your collection! And now you can acquire not one, but THREE Gold Pandas in one incredible Mini Prestige Set! The coins in this set are the 1-gram 10 Yuan, 3-gram 50 Yuan and 8-gram 100 Yuan Gold Pandas. 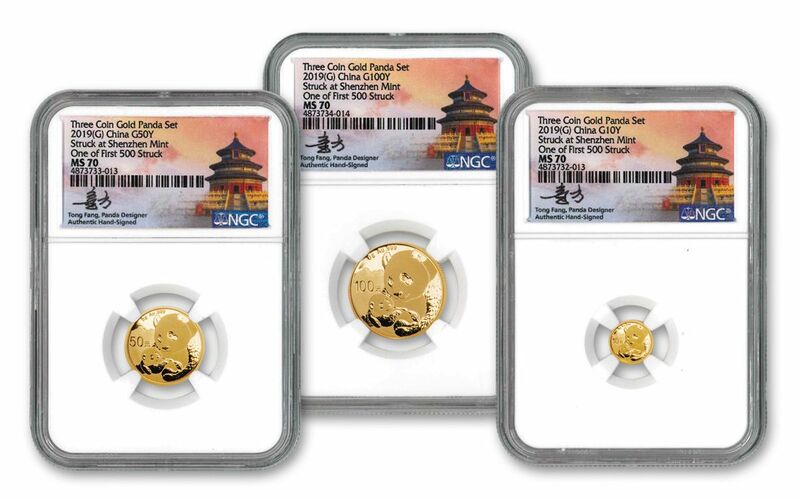 In addition, each has been graded by the Numismatic Guaranty Corporation (NGC) as being in perfect Mint State-70 (MS70) condition, a distinction that means your perfectly graded 2019 Gold Pandas will have ZERO imperfections -- showing all features and fields exactly as the engraver and mint intended. 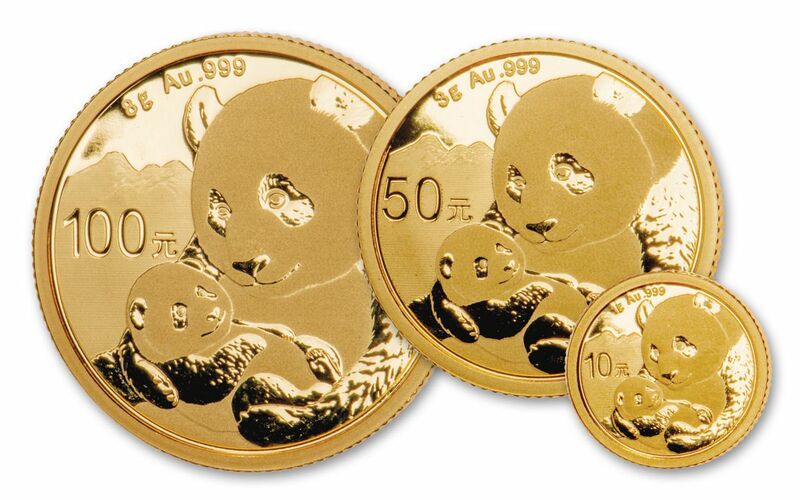 Plus, NGC has graded your Gold Pandas to be a First Day of Issue (FDI) coins, meaning each was received by NGC or an NGC-approved depository by the release date or on the business day within 24 hours of the official release date. In fact, the labels state that these coins were among the first 500 coins struck! Each coin comes encapsulated in an acrylic holder with an exclusive label that identifies it as having come from the China Mint at Shenzhen. Finally, each label was personally signed by 2019 Panda designer Tong Fang! This is your chance to jump on these Pandas now before Chinese collectors grab them all for themselves. Don’t wait – only 500 Mini Prestige Sets are possible. Show off the best of the first of this year’s Gold Panda series and secure yours now! 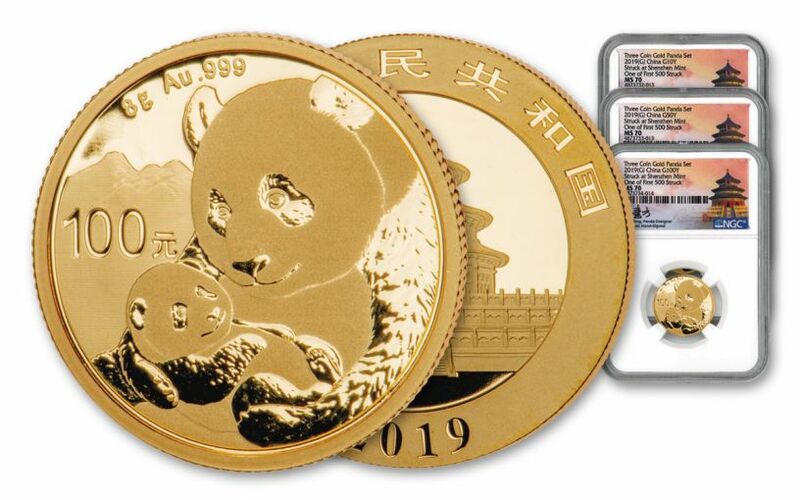 CHINA LEGAL TENDER – Each 2019 Gold Panda is legal tender in China, as seen right beside the Pandas on the reverse. The denominations in your set range from the 1-gram 10 Yuan, 3-gram 50 Yuan and 8-gram 100 Yuan coins. 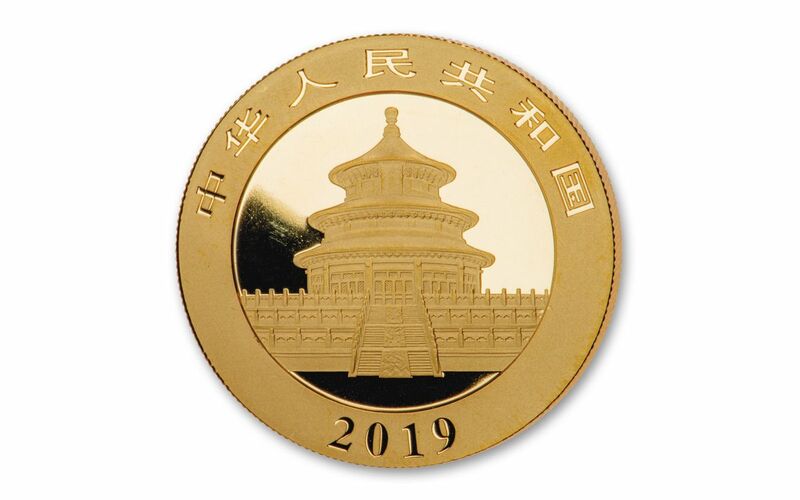 Flip each coin over and you'll see the date, the inscription of “People's Republic of China” in Chinese and an image of the Hall of Prayer for Abundant Harvests, located in Beijing’s Temple of Heaven. KEY FIRST DAY OF ISSUE CERTIFICATION – In addition, NGC has graded your Gold Pandas to be a First Day of Issue (FDI) coins, meaning each was received by NGC or an NGC-approved depository by the release date or on the business day within 24 hours of the official release date. In fact, the labels state that these coins were among the first 500 coins struck! MINT-IDENTIFICATION LABELS SIGNED BY THE DESIGNER – Each coin in this three-piece set will come sonically sealed in an acrylic holder with a label that identifies it as having come from the China Mint at Shenzhen. In addition, each label was personally signed by 2019 Panda designer Tong Fang! Don't miss out on this chance to either continue your China Panda collection or to start a brand new chapter. Selections from the series tend to sell out quickly, so don't wait too long – add this 2019 China Gold Panda Three-Piece Mini Prestige Set to your cart today!